Any of you folks ever shot the mark 23? I love the looks and the capacity of this pistol and im seriously debating selling one or two of my guns to cover the cost of one. The only problem is ive never even held one or spoken with anyone who has. Think i might have to run down to Brunswick and check one out soon. Nope...sorry to say I never even heard of it. Want to fill us in on the details...?! The H&K Mark 23 is a .45 semi auto pistol with a 12 round mag capacity. Its the first .45 cal pistol to be issued to US troops on a large scale since WWii. It is pricey but lord its a beautiful gun. Comes with a thread on barrel for a suppressor. heres a link for those who are interested in its specs. Theres quite a few H&K pistols with all most the same options but the Mark23 is the crown prince of the line. Well at least in my opinion. Was thinking of selling my Colt Anaconda 44mag and using the money for the Mark 23. I never shoot the 44 anyways. Just a thought i had what yall think? Indeed a fine looking Semi-auto pistol! I personally like the Colt Model 1911A1, first exposed to one in 1983, and after they went to the Beretta's made me like them that much more. If I could conceal carry a 1911 I'd do it but as we know that ain't feasible. ColdWarGrunt wrote: Indeed a fine looking Semi-auto pistol! I personally like the Colt Model 1911A1, first exposed to one in 1983, and after they went to the Beretta's made me like them that much more. If I could conceal carry a 1911 I'd do it but as we know that ain't feasible. 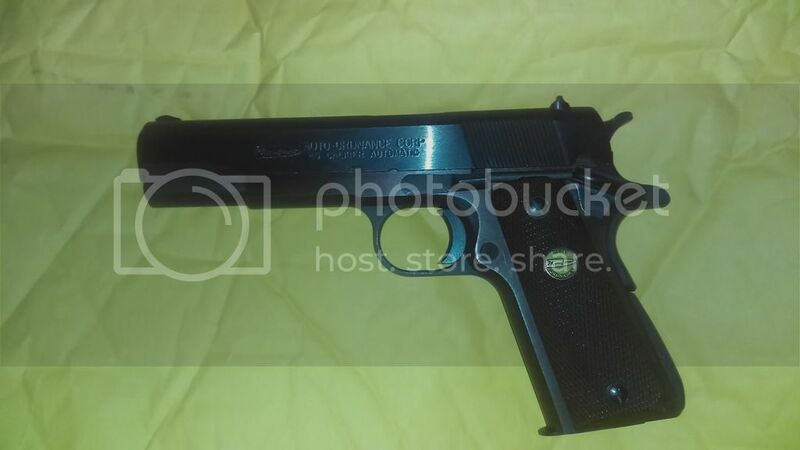 My father left me a Thompson Auto Ordnance Corp. .45 1911 style pistol which i like very much. Theres something solid and secure about the 1911 style pistols which, in my opinion, makes them so popular. Heres a pic of the Thompson. I own a few Thompson's myself...a solid platform for the .45 ACP...over a century old. Thompson is a fantastic arms manufacturer!